I’ve spent the last few days researching my black female guitar foremothers in an almighty playlist that I’ll share with you all soon. In the process I discovered Lady Bo, lead guitarist in Bo Diddley’s band from 1957-1961. Lady Bo, real name Peggy Jones, was the first female guitarist to be hired by a major act and was a huge influence on Diddley and his sound. After a while he opened his guitar, asked me to grab mine and play something. When I opened my case he laughed louder than anyone I’d heard before. I wanted to know what’s funny? Hysterically he said what is that? He had never seen a Supro guitar. I said, “Now that’s a dumb question! First you probably never saw a girl carrying a guitar down the street before and want to know if I played it, did you think that was funny?” He said, “No!” I continued, “then you insult my ax and I listen to Wes Montgomery, Kenny Burrell and Charlie Parker and I think I’ve heard of you! Do you think that’s funny?” He said, “No, but I like your attitude, let’s play something.” I said OK and the rest is history. Although Jones had only been playing guitar for two years she had shown a talent for music from a young age. Growing up in the Sugar Hill district of Manhattan she enjoyed tap dancing at an early age and studied opera and learnt the ukulele at age nine. She graduated from New York’s High School for Performing Arts studying dance, drama and music theory. Jones was hired first as a session musician and then full time to replace Jody Williams who was enlisted in 1957. She quickly learnt Diddley’s distinctive open tuning and began to develop her own instinctive way of playing guitar. Her guitar work and backing vocals can be heard on classic hits such as ‘ Hey Bo Diddley’, ‘Roadrunner’ and ‘Crackin Up’. The interplay between the two guitars was integral to the sound. 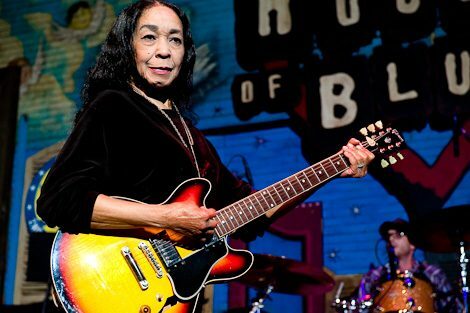 They switched between lead and rhythm so often that Lady Bo was quoted saying “you couldn’t tell one guitar from the other unless you were there.” Lady Bo’s style can be heard best in her composition ‘Aztec’ in which she plays all the guitar parts. Lady Bo left Bo Diddley in 1961 to start her own group The Jewels, later known as Lady Bo & the Family Jewels, and had a hit withe northern soul influenced ‘We Have Togetherness’. I guess they were not happy with my real name because the true original sound of Bo’s music had just been authenticated. It was evident that the packed house now recognized that the girl guitar player was an integral part of the real rhythm Diddley is famous for especially that night in live performance. The traded guitar licks with telepathic efficiency between Bo and me spoke for itself. Jones also appeared on recordings by Eric Burdon and the Animals, appeared in James Brown’s backing band and toured extensively with The Jewels. I was shocked to find that despite her place in history alongside Bo Diddley Lady Bo is not well known and does not even have her own Wikipedia page (her replacement Norma-Jean Wofford aka The Duchess only has a small entry). How to spread the word about her impact and history then? Well write about it, listen to it, remember it and tell others. Too often black women are written out of history. Lady Bo deserves to be remembered. Tags: bo diddley, guitar, lady bo, norma jean wofford, peggy jones, retrospective, rnb, the duchess. Bookmark the permalink. I’ve loved Aztec for many years and only tonight learned it was Peggy Jones. Such a shame she never got the credit.